The CHOOSEMATHS Grants are designed to provide support for Australian female mathematical sciences students and early career researchers to participate in the AMSI Flagship programs. The grants support women to build and extend their skills and professional networks by providing financial support to attend and/or assist with caring responsibilities. We recently caught up with Rosemarie Herbert, the winner of the 2015 BioInfoSummer CHOOSEMATHS grant to find out how the grant helped her attend the Flagship program and to hear about her studies in genetics. Research: Genetics: The genetic basis of adaption between Wolbachia and novel host species and how this may affect dengue virus transmission in mosquitoes. Your PhD research focuses on genetics, specifically the genetic basis of poor adaption between Wolbachia and novel host species and dengue virus transmission in mosquitoes. Can you give me a of this research and its potential impacts for the broader community. Well, Dengue virus is one of those diseases you catch once, and you might have mild flu symptoms. It’s the second time that you catch it that it kills you. Sometimes literally. It’s spreading into Australia from Queensland and tourism, and its only going to get worse as the tropical areas of the world expand. Researchers have discovered that putting Wolbachia into mosquitoes stops Dengue virus from being transmitted, but we have no idea why. What I am trying to do is work out what changes are associated with the bacteria interacting with the mozzie before Dengue virus is even present. Hopefully this will help us prevent the virus circumventing the new biocontrol procedures. You received a CHOOSEMATHS Grant to assist your attendance at AMSI BioInfoSummer. This allowed you to travel with your partner and child. How important was this in terms of your ability to attend and fully participate in the sessions throughout the week? Without the grant, there was no way I was going to be able to afford to come. Although my child is in Primary School, it’s often underestimated how much work still goes into this. As I am the parent with the more flexible schedule, it is my role to meet those childcare needs. When I received this grant, I was very excited as it was the first conference I had attended outside my home university. The workshops were amazingly helpful, and being able to attend without worrying what time I needed to get home was priceless. One of the areas you were hoping to build on at BIS was your understanding of complex statistics. Did you end up addressing this, what else did you take away that has impacted your research? I felt quite overwhelmed for learning some of the complex statistics, but I got a better grasp on the medium concepts that I never could have mastered on my own. The biggest thing for me was being able to get a taste of a range of offerings, and so think about other projects that might be of interest next. Attending things like this mean that pieces of science that seem otherwise unattainable suddenly become reasonable to learn. You plan to pursue research consultancy opportunities within BioInformatics rather than a fulltime academic career. What factors has influenced this decision? Is this indicative of a broader issue for women in research? I’m passionate about teaching in a university setting. I’ve always had fantastic teachers that were involved in my love of science, and I want to give something back. I’m not particularly interested in academic career because of the job instability. With a young child and a partner in a specific work role, we are unable to move to meet my work needs. Going overseas to chase ‘tenure-track’ positions is out of the question. 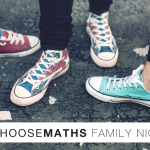 CHOOSEMATHS is also about strengthening mathematics education at the school level both through teacher training and student engagement with a focus on girls and women. Did you always want to pursue science and maths? Were you encouraged to study these subjects at school? Do any particular mentors come to mind? I always knew I wanted to pursue science and math. I was always good at math, but science ended up being my true calling. I had very encouraging male and female teachers of science through high school. This culminated in having a fantastic female biology teacher who took students into her home to tutor them. She knew that I was passionate about science, and supported my interest into tertiary study.